Focus on honing your abdominal imaging diagnostic skills. 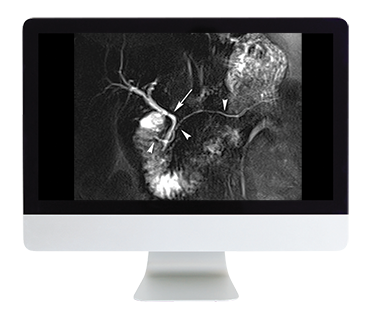 This special course combines 26 traditional case reviews with 6 didactic lectures with deeper insights into abdominal imaging. Learn and earn credit at your own pace with unlimited access to this course through August 31, 2019. See below for learning outcomes and a list of modules and individual lectures. This course package offers 13 CME and SA-CME Credits following completion of an online test. After completing this course, the learner should be able to recognize the imaging and clinical features that allow for refinement of differential diagnosis enabling a more specific diagnosis; outline management decisions affecting a variety of commonly encountered clinical scenarios; judge some of the more commonly encountered artifacts in abdominal imaging and describe why they occur and techniques to avoid them; and more. The ARRS designates this enduring material for a maximum of 13 AMA PRA Category 1 Credit(s)™ and 13 American Board of Radiology, MOC Part II, Self-Assessment CME (SA-CME) credits. Physicians should claim only the credit commensurate with the extent of their participation in the activity.